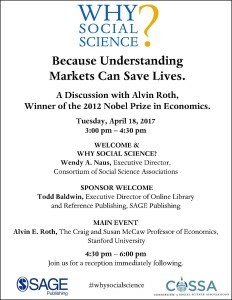 Dr. Alvin Roth is the Craig and Susan McCaw Professor of Economics at Stanford University, and the George Gund Professor Emeritus of Economics and Business Administration at Harvard University. Dr. Roth’s fundamental research in market design has revolutionized kidney exchanges, allowing incompatible patient-donor pairs to find compatible kidneys for transplantation. 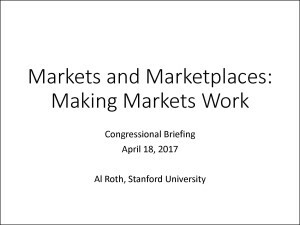 Dr. Roth’s matching theories have also been applied to school matching systems used in New York City, Boston, Denver, New Orleans, and several other cities, among other applications. Learn how social science can have real, significant impacts on our everyday lives, often in unexpected ways. This widely attended event was made possible with support from Representative Eddie Bernice Johnson and SAGE Publishing.